Jennifer is a Vice President and is the engine that keeps the team running. 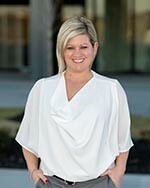 Relocating from Michigan she brought her administrative, customer service skills and unrelenting energy to the Johnson Smith Team. This combined with her knowledge of Real Estate and drive to serve her clients has made her a successful and respected Agent as well as an integral part of the team’s success. Our four-person team with extensive experience of the Real Estate Market strives to provide service based on your wants and needs, using up-to-date market knowledge and utilizing the tools of today. Together we have over 60 years of experience in all segments of the Real Estate Market. The team has been a multi-million-dollar producer with a strong base of repeat customers and referrals for many years. With one of the best reputations among agents and agencies in the industry they are committed to excellence. “Really excited to purchase a home with the help of Jennifer Shapley! She has a great sense of humor and was the perfect person to help me transition to a new spot. Thank you!” -Megan S.